Learn It From One Of The Best! We all have that one move or position that seems to be a pest no matter how hard we focus or train to get better at it. It varies from grappler-to-grappler, but a very common position many people seem to have problems with is the half guard. This is understandable given that it’s a tough spot to be in and it limits many of your potential attacks. Having your legs tangled up and your back to the mat with your opponent threatening to advance his/her position can lead to a sense of urgency, making you even more vulnerable than what you already are. However, rather than sweep it under the rug, you should embrace the position! Learning moves from here will help make a weakness a strength, and it will also put you ahead of the game! But you’re probably thinking to yourself, “Where do I start? !” Have no fear and continue reading. When it comes to Brazilian Jiu Jitsu, there are few that execute the half guard attacks as well as ADCC Absolute Champion Roberto ‘Cyborg’ Abreu! Today, we’ll look at his straight arm lock from bottom half guard. First off, it’s helpful to have your outside leg on top of your other foot. Once you do this, keep your knee aligned with his same-side shoulder. Next, cup his head while also gaining wrist control. The next step you’ll want to pull him towards you, and plant your top foot on his hip. Once you do this, free your leg that is under him and place it on the other hip. Swing your hips to the opposite side, bringing your knee to his bicep, and your top leg underneath him. Reverse your head & wrist grips as you will be facing the opposite direction. You now have control of his hips, head and wrist from the bottom half guard position, allowing you to mount an offensive attack from here. Roberto shares some tidbits of information that is very valuable, especially for those NoGi guys out there! Since he doesn’t wear a Gi, there are no way opponents can get strong grips. For this, Roberto has a nice plan of attack. With the knee you have up near their shoulder, bring it across slightly while maintaining control of the head. Pulling the head in, drive the knee into the sternum. As you do this, you’ll want to bait them by bringing your head to their bicep. 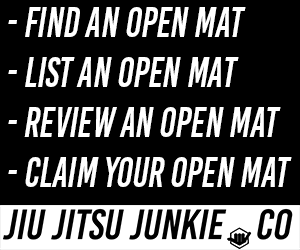 Once they do, you can apply a straight arm lock, getting yourself the submission victory! So just like that, you have a beautiful setup and finish from the bottom half guard! See, it isn’t as bad as you’d think!